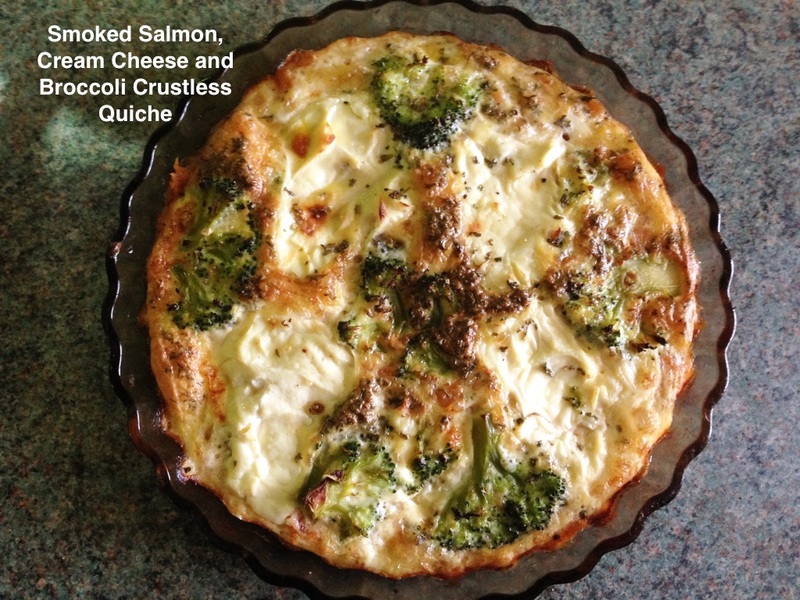 This crustless smoked salmon quiche with cream cheese and broccoli is perfect for low carb and gluten free diets. It's only 15 Weight Watcher smart points as well - so a generous quarter is 4 points. Add some new potatoes and salad, fat free dressing and you've got a super tasty meal for around 9 points. Being crustless, it's quick to put together and if you're not a pastry expert, then you'll love this. It makes a great base recipe for a number of different quiches - I use chopped vegetables or cubed ham as well. Please give it a thumbs up and subscribe to my channel. I need all the encouragement I can get - it's so nerve wracking! Set your oven to 350F, 175C or Gas Mark 4 whilst you assemble the quiche. Spray an 8" shallow dish with oil. Arrange the smoked salmon on the base - spread it evenly. Divide the cream cheese into four and place it evenly around the dish. Arrange the broccoli or asparagus in between. Beat the eggs with a tablespoon of water, ground black pepper and some herbs of your choice. Into the oven for around 30 minutes - the top should be set firm, give it another five minutes or so if it's not. Let the smoked salmon quiche cool in the dish for ten minutes or so, that will make it easier to remove cleanly. I like to serve this with some new potatoes and chopped salad. I use either low fat mayonnaise or a fat free dressing. This is perfect for picnics - it's just as tasty cold. A super simple and tasty Crustless Smoked Salmon Quiche, low carb, gluten free. Really easy and quick to make.